Description This Pine Mountain, Georgia hotel has an outdoor pool, free internet access and non-smoking guest rooms. This hotel is also pet friendly. An outdoor pool free breakfast and well-equipped rooms with free Wi-Fi complement the convenient location of Garden Inn & Suites. All 60 rooms at the two-story hotel have free Wi-Fi cable TVs with HBO and ESPN coffeemakers microwaves and mini-fridges. There are 21 suites some with jetted tubs. Guests can enjoy the seasonal outdoor pool to wind down a day of exploring nearby attractions. Pets are allowed for a fee. The hotel is on U.S. 27 about eight miles from I-185. The Little White House in Warm Springs was Franklin Roosevelt's presidential getaway; it's about 10 miles away. Wild Animal Safari about 10 minutes away by car has exhibits featuring exotic animals. Callaway Gardens is less than five minutes away. Hartsfield-Jackson Atlanta International Airport is about 71 miles away. 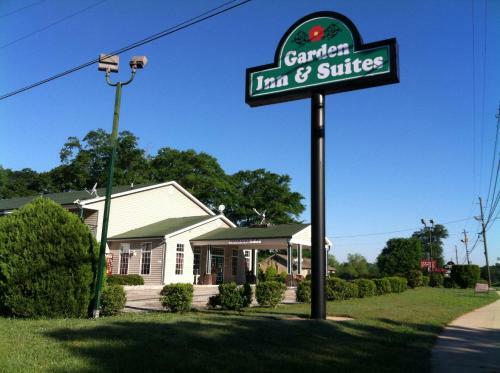 Add Garden Inn & Suites to your free online travel itinerary.